A small to medium-sized tree, often with many stems, up to 30 metres tall. In forests, it has a slender trunk that often curves before extending to the narrow, oval-shaped crown. In the open, the crown is pyramid-shaped. Triangle- or egg-shaped, about 8 centimetres long, and doubly toothed; dull green on top, paler with a soft down underneath. The flowers are either male or female and are in narrow catkins. Female catkins are 2 to 4 centi-metres long, standing erect at the tip of the branch. Male catkins are longer and hang below the branch. The flowers appear before or at the same time as the leaves. The nutlets have wings broader than the seed. Each tree produces thousands of seeds. Thin, white to reddish-brown, with dark horizontal slits (lenticels). It peels in papery strips, exposing reddish-orange inner bark which will gradually turn black with age. It is found throughout British Columbia but only in a few scattered places on the outer coast. Paper birch grows on a variety of soils, and is abundant on rolling upland terrain and floodplain sites, but it also grows on open slopes, avalanche tracks, swamp margins and in bogs. It doesn't grow well in shade, and consequently it often occurs in younger forests following a disturbance. Paper birch can be an important winter food for many forest animals including deer and moose. It is also a favourite food of snowshoe hare, porcupine, and beaver. 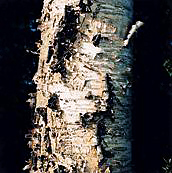 Many birds will nest in paper birch, including woodpeckers, sapsuckers, and vireos. Many First Nations people in British Columbia used birch bark as material for baskets, cradles, and canoes. They also used it for wrapping and storing food and for roofing pit houses. They used the wood for many small items, including bows and spoons. They drank the sap as a medicine for colds. Birch sap can be used to make syrup, but it requires 80 to 100 litres of sap to make one litre of syrup! 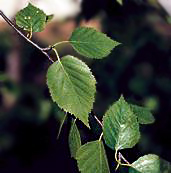 Undiluted, birch sap can be used to make vinegar or birch beer. Birch is harvested in eastern Canada for pulp, sawlogs, and veneer logs; the wood is used for products such as paneling, tongue depressors, and cheese boxes. 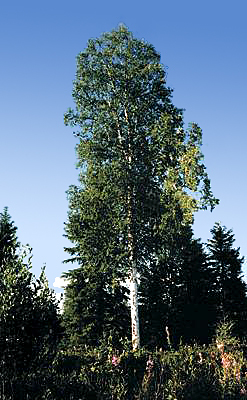 In British Columbia, paper birch is harvested for firewood. Papyrifera means "paper-bearing," referring to the bark. 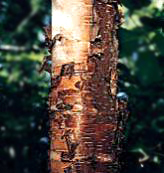 Alaska paper birch (Betula neoalaskana) occurs in northeastern British Columbia; its twigs are densely covered with bumpy resin glands.